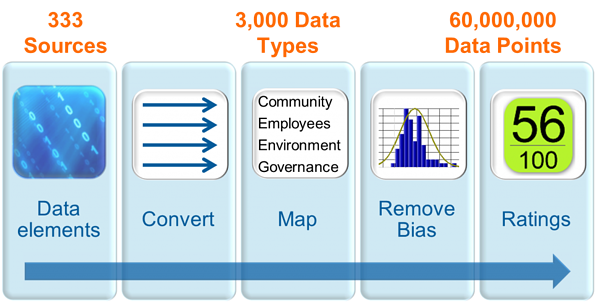 We have previously defined “Big Data” and shown how we feel a Big Data system built by CSRHub could help address some problems that exist in collecting corporate social responsibility (CSR) and sustainability data on companies. We have also further described the problems with the currently dominant method of gathering this data—an analyst-based method. CSRHub uses input from investor-driven sources (known as “ESG” for Environment, Social, and Governance or “SRI” for Socially Responsible Investment), non-governmental organizations, government organizations, and “crowd sources” to construct a 360 degree view of a company’s sustainability performance. The illustration below shows the steps in our process. Convert measurement from each data source into a 0 (low) to 100 (high) scales. This requires understanding how each source evaluates company performance. We compare each source’s ratings with those for all other sources. Each company we study gives us more opportunities to compare one source’s ratings with another. The total number of comparisons possible is very large and growing, exponentially. We use the results of our comparison to adjust the distribution of scores for each rating source so that they fall into a “beta” distribution that has a central peak around 50. Some sources match up well with all of our other data. Some sources don’t line up. We add weight to those who match well but continue to “count” those who don’t. We then repeat steps A to D as many times until we have found a “best fit” for the available data. Each time we add a new source, we go through an initial mapping, normalization, and weighting process. It may help explain our data analysis process by using a specific example. Hewlett Packard is a heavily tracked company. We have 154 sources of data for this company that together provide 17,571 individual data elements. Only 62 of these data sources provided data for our July 1, 2014 rating—the rest of the data sources provided data for previous periods (our data set goes back to 2008). The 62 current data sources provided 575 different types of rating elements and a total of 610 different ratings values that do not affect/apply to special issues. Before we can present a rating, we need to check first that we have enough sources and enough “weight” from the sources we have, to generate a good score. In general, we require at least two sources that have good strength or three or four weaker ones, before we offer a rating. As you can see, we have plenty of sources to rate a big company such as HP. Even after normalization, the curve of ratings for any one subcategory may have a lot of irregularities. However, we have enough data to provide a good estimate of the midpoint of the available data, for those ratings we report. Below you can see that some sources have a high opinion of HP’s board while others have a less favorable view. 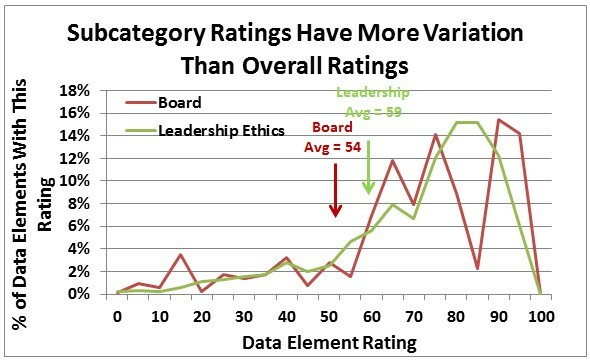 The result is a blended score that averages to less than the more uniform Leadership Ethics rating. The overall effect of our process is to smooth out the ratings input and make them more consistent. As you can see in the illustration below, the final ratings distribution is organized well around a central peak. The average overall rating of 64 is below the peak, which is around 80. The original average rating was 61. By making a few assumptions about how the errors in data are distributed, one can assess the accuracy of ratings. In a previous post, we showed that CSRHub’s overall rating accurately represents the values that underlie it to within 1.8 points at a 95% confidence interval. In our next post, we will discuss the benefits and drawback of using this complex and data intensive approach to measuring company CSR performance. See part 1, Using “Big Data” to Rate Corporate Social Responsibility: One Company’s Approach. CSRHub provides access to corporate social responsibility and sustainability ratings and information on 9,200+ companies from 135 industries in 106 countries. By aggregating and normalizing the information from 348 data sources, CSRHub has created a broad, consistent rating system and a searchable database that links millions of rating elements back to their source. Managers, researchers and activists use CSRHub to benchmark company performance, learn how stakeholders evaluate company CSR practices and seek ways to change the world. We have previously defined “Big Data” and shown how we feel it could help address some problems that exist in collecting corporate social responsibility (CSR) and sustainability data on companies. We have also further described the problems with the currently dominant method of gathering this data—an analyst-based method. CSRHub uses input from investor-driven sources (known as “ESG” for Environment, Social, and Governance or “SRI” for Socially Responsible Investment), non-governmental organizations, government organizations, and “crowd sources” to construct a 360 degree view of a company’s sustainability performance. To better understand this process, let’s consider an example. Some of these data elements could map to more than one subcategory. For instance, a company that is on the list of “Best Workplaces for Commuters” would get credit both for its energy saving effort (in “Energy & Climate Change”) for the benefit its programs bring to its employees (in “Compensation & Benefits). The list above includes examples of each of the three main contributors to the system: Investment-related sources (Asset4/Thomson Reuters, Carbon Disclosure Project, GovernanceMetrics International/Corporate Library, IW Financial, MSCI, Trucost, Vigeo); Activists and NGOs (Accountability, BSR, CorporateRegister, CR 100, EIO, FCPA, Top 50 Socially Responsible); and Government & Consumer (Better World, Black Engineer, EICC, EPEAT, UN Global Compact, UNODC, Working Mother). The completed mapping process connects the 494 data elements from the 56 sources for HP into our twelve subcategories in 971 different ways. Each value from each data element is converted into a zero to 100 rating (zero = lowest, 100 = highest). These scores are then adjusted by comparing them to each other. In the example above, there are 11 sources for HP’s board performance. Suppose three of them gave it a great rating, six a medium rating, and two a poor one. Computer analytics would guess that the six scores that agree are correct and that HP’s board rating is in the medium range. The assumption is that three sources tended to be biased towards high scores and two towards low scores. 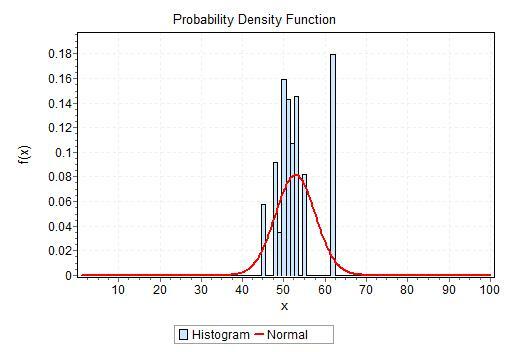 This chart shows the actual distribution of scores at the subcategory level, along with a calculation of the “normal” error curve that results. When the analysis is repeated across thousands of companies, a picture emerges as to which sources tend to be overly positive or negative and which tend to predict the “mean” of the other sources. All sources can be adjusted, based on this feedback—moving them up or down so they more accurately match the opinion of all other sources. After a large number of iterations in this process, there is a consensus score for each subcategory for each company analyzed. 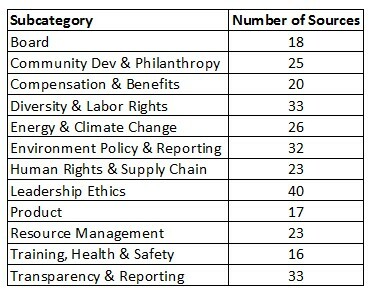 CSRHub provides access to corporate social responsibility and sustainability ratings and information on nearly 5,000 companies from 135 industries in 65 countries. 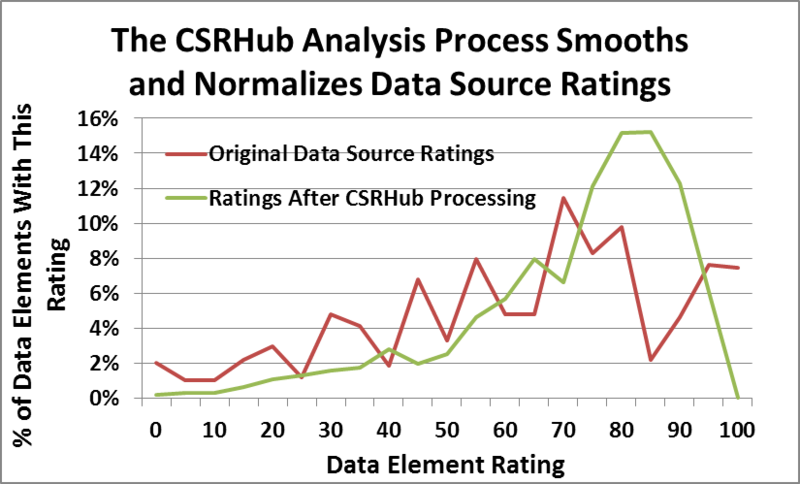 By aggregating and normalizing the information from over 170 data sources, CSRHub has created a broad, consistent rating system and a searchable database that links millions of rating elements back to their source. Managers, researchers and activists use CSRHub to benchmark company performance, learn how stakeholders evaluate company CSR practices and seek ways to change the world.